The Nine of Wands tarot card is one that symbolizes great hope even when one is faced by many problems that threaten to make them lose their balance. The Nine of Wands symbolizes one's life, which has undergone too many trials but through their determination and will, they were able to overcome them. These won battles are symbolized by the eight upright wands; however, there are still more trials that the person may face. This can be one major trial or challenge that they are supposed to face for them to reach their goals or be successful in their quest. The card is a sign of hope and encouragement that you should face your trials with courage so that you may attain success. The Nine of Wands symbolizes a life of someone who has undergone many trials, but through determination and will, they were able to overcome them. The Nine of Wands reversed shows a person who may not be a risk taker; they may not want to make a long-term move or commitment since they are afraid that they may not be able to come out of it. They are mistrustful and hence have created a boundary between themselves and others which is turning to be their own personal prison. You may be afraid that you do not have enough resources to face some upcoming challenges, which is why you may be open to running away or avoiding it. However, this is a situation that needs to change since this could be your self-created restriction to prevent you from attaining the new heights you need to grow. It encourages you to be brave, but also be careful not to make careless or hasty decisions that may cost you in future. 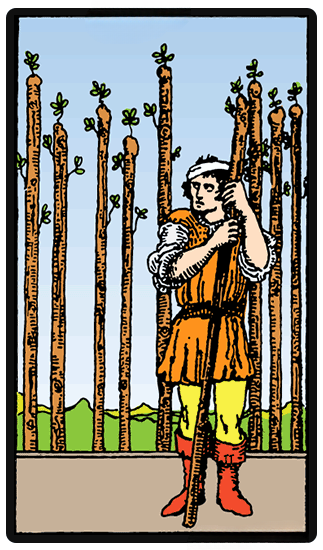 The Nine of Wands may be an indication of a great personal fear or mentality that could affect you. Hence, it is important that you do something to deal with it before fear consumes you and prevents you from moving onward.